A Victoria Birder: Snowy in May? During the winter, I used the term a couple of times to refer to the weather, but today, it is anything but! I was enjoying the sun through my office window this morning, peering over a stack of files that still needed to be cleaned and organized, when my phone kicked out its "Surfin' Bird" ringtone. This ringtone is reserved for those who actively bird, and it tells me "you had better answer me!" 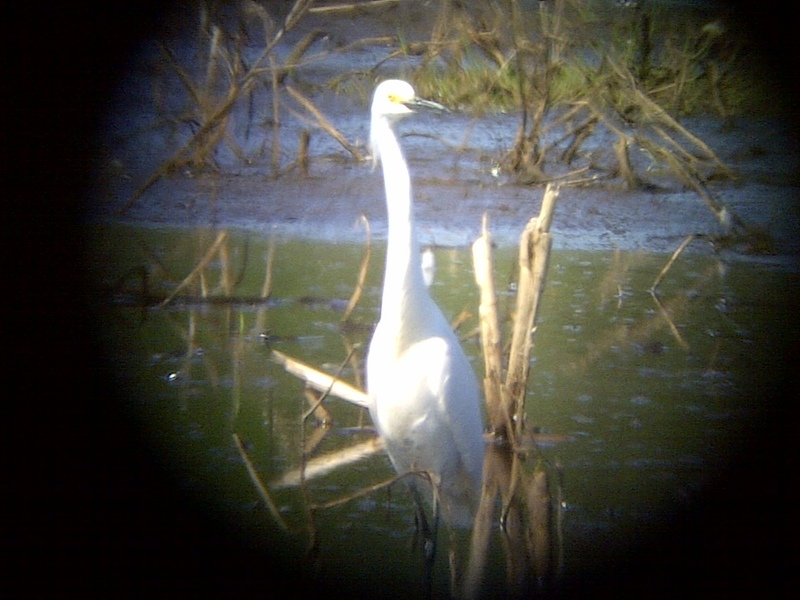 This time it was Chris Saunders on the other end, and he only left me wondering for a moment at what might have shown up at Swan Lake before telling me some of the more exciting news I have heard recently, "Warren Drinnan found a Snowy Egret at Panama Flats!". Hard to believe that this is the best shot I got! We enjoyed the egret for about half an hour or so as more birders showed up in drips, drabs, and hordes. It darted from one end of the water to the next, chasing whatever morsel it could turn up, and stopped several times to stir the water up with its foot. What neat behaviour, something I had never seen them do before! I always hate walking away from a bird like this, but I had a lot more work to do back at the office. This was not only a new Victoria bird for me (and #196 for the year), but a new BC and Canada bird as well!